A copy of Demon Frenzy was sent to Confessions of a Reviewer by the author Harvey Click in exchange for an honest review. This is said review.The story with this one is as follows. Mr Click sends me a review request and for some reason it goes into my spam folder so I don’t see it for a few days. When I do see it I agree to review and put it in the schedule. When I come to it, I open it and, sorry for this Harvey, spot the cover and immediately think “oh dear”. I really didn’t like it at all. This sort of put me off reading it. EDIT: It appears the cover may have changed from the edition I have. Phew. It’s much better.You know the old saying don’t you? “Never judge a book by its cover”? It’s true. What I was expecting and what I got were two completely different things.Amy Jackson is returning to her hometown of Blackwood in the Appalachian Mountains on a quest to find her missing brother, Billy. When she gets there she is confronted with a town that has completely changed since she was last there. It seems to be completely under the control of “The Mayor” who just happens to be a huge drug lord.When she goes to the old family home she sees something that scares her to her very core. It appears that the Mayor has a bigger army than anyone thinks. It seems that he also has control over a huge number of demons.Amy teams up with Neoma and an unlikely band of misfits calling themselves “The Unseen” in a quest to destroy the Mayor and his army of demons using anything they can, including some mystical powers that Amy didn’t know she possessed.Now, giving the issue I had with the cover, I went at this book a little bit hesitant. I know I shouldn’t because I should know by now that it’s the content “between” the covers that actually make the story. I read chapter one. I was blown away. This one single chapter left me more scared than any other book I have read in a while. My skin crawled for hours afterwards. It is written in such a way that the tension builds perfectly and in old skool horror style, at the end of the chapter, you feel yourself running for your life with Amy. It genuinely left me creeped out in the biggest possible way.Basically the story follows Amy as she is “rescued” from a situation that could cost her life and dumped in a hidden compound with Neoma and her “army” of Unseen as they prepare themselves for a battle with Sandoval (the Mayor) to try and destroy him and his demons.Characters wise in this story, we have a couple of stand outs and a few stragglers. Amy and Neoma take up much of the story in a complicated relationship that switches between hatred and a weird kind of love between them. Neoma tries to teach Amy to use her gifts to help them in their quest. Gifts she didn’t know she had. The rest of the Unseen are made up of different, ordinary people who have been affected in one way or another by Sandoval’s demons and are out for revenge. They all work pretty well together but none of them have the same amount of time on the page as Amy and Neoma.After the first chapter being so wonderful and scaring the crap out of me I was left feeling a little bit flat in the middle section when Amy was learning her trade in the compound. There were a couple of bits of action when demons strayed onto their property but nothing to keep the same level of excitement. It was interesting in the fact that you follow Amy and learn about astral projection and telekinesis and how she must perfect both powers and learn to fight with sabre’s and throwing knives to help them prepare for their final battle. It just seemed to drag on a bit without much “frenzy” from the demons. If this had been a television series then it would have worked much better watching the characters prepare for war but alas in a book it didn’t quite work for me.Then we come to the closing scenes. One hundred and one miles per hour the whole way! The final battle with Sandoval and his demons doesn’t exactly go to plan but the writing in this sequence is fantastic in giving you a feeling of absolute fear and you know if you were involved you would have been running for your life. Full of hideously deformed demons of all descriptions, it does leave you a bit breathless. It’s well written and does present your mind with a wonderful picture of mayhem, if you let your mind go.One last gripe for me is the final, final pages when the loose ends are tidied up. This for me felt a bit rushed and could have done with a bit more detail to give you a more satisfied feeling at the end.To summarise: An opening that will give you the creep’s big style. A middle section that could have been filled with more for me and an ending that lifts you right up again. Just stick with the middle section if you read this because the final battle scenes are worth it. A few negatives which brings the score down for me but overall this is a really good read. I just wish it all had been like the first chapter.General rating:★★★ Good story but needed more in the middle.Horror rating:★★★★ Brilliant scares, Chapter One in particular. The thing about Genre books is this, it’s very easy to write an average one. That is to say by their nature they often follow set simple patterns which are easy to detect and replicate. This is not to say they are simplistic or that there is no craft to them. Indeed the reverse is true, in order to write something which will hold the interest of its readers in a field crammed to the rafters, an author needs to craft his work carefully and with all his talent. That is if he hopes for his work to rise above the herd.Harvey manages to accomplish this most difficult of tricks with an undeniable skill, while following a pattern well-trodden. I normally avoid spoilers when it comes to plot but I will make a vague exception in this case because of the pattern it follows which is hard to talk about without doing so. Consider therefore this a mild warning. We start with Amy, a woman of hidden skills, who returns home to the small town of her birth after her brother ceases to reply to her weekly phone calls. What she discovers on her arrival is that her home town had changed in the years she has been away, becoming a darker nastier place all round, and the returning girl is far from welcome. The first third of the novel covers the first couple of days of her return and the growing sense of unease as Amy gets herself slowly in deeper and deeper to the mystery of her home town’s dark underside. Then things get nasty in the second third when she is 'rescued' by a group of individuals planning to end the reign of terror being perpetrated on the town. Her rescuers are secretive and less than welcoming, even when Amy's skills seem to grow. All of which leaves Amy between a rock and a hard place, the Bad want her dead, the good side which is at best shades of grey don't all want her alive either, and she gets the blame when things start to go wrong.Then everything goes wrong and all hell breaks loose in the final third. Amy's skills come to the fore but will she prevail...In many ways it’s a reworking of so many other novels in the genre.The important thing in all this is however the writing. Harvey manages to pull it together and make a simple genre story and make it seem fresh and initiative all the same. The action moves quickly and is well paced. The characters have a believable quality for all the unreal stuff surrounding them. They are well drawn and have individual qualities, while the setup of the plot has its own interesting quirks which help to draw the reader in. In short Harvey takes what should be run of the mill average Genre fare and makes it riveting, involving and keeps you reading. Making this well-trodden path a fine adventure. Demon Frenzy is one of those books that you just cannot put down. Harvey Click creates a bizarre, grotesque world where the lines between good and evil are blurred. The vividly imaginative descriptions in this nightmarish tale create an adult picture book for the reader. The unbelievable, soon becomes feasible.Circumstances become intense when reading this novel. You can actually feel the the emotions and see the creatures Click describes through his vivid imagination; at times I questioned my sanity. The tension becomes plausible as you make your way through this intelligently written horror story.Many times while flipping through the pages, my heart pounded with anticipation and in reaction to the characters experiences. Each character is uniquely described, we get to learn their secrets and become acquainted with them both inside and out. The author fleshes out each one of the many characters creating an understanding between reader and book dweller.Perhaps the most unique part of this tale, is its creative display of unprecedented characters and demons. Once you open these pages you enter a peculiar world unbeknownst to anyone. Unlike many other horror stories, Demon Frenzy is not just a regurgitation of other horror tales; it is its own horrifically delicious nightmare. Finally, an author that does not rely on the characters sexual appeal to sell a horror novel! As someone who is very much considering self-publishing for my already written horror/action multi-genre novel, it brings me great pleasure and hope to have read this.It starts off as straight horror, and well done it is. The return to a burned out Appalachian town of childhood to search for a missing brother uncovers a drugged up and suspicious populace and stalking monsters.But then it changes into a horror themed action novel, much like how Alien begat Aliens. And for me, this works quite well and was a pleasure to read. The monster design was particularly good. Though perhaps the final scene lacked any appearance of the cover-art demon who was built up quite a lot, and the secondary demon seemed to leave the stage a bit abruptly, but this didn't really affect the story or its pacing. 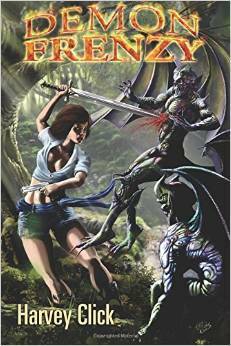 Demon Frenzy by Harvey Click is the first book in the demon series. Amy is concerned about her brother, Billy. He hasn't been answering or returning her calls. Amy returns to their childhood home and realizes her brother is in some kind of trouble. Going to the local police is out of the question, they just want her to leave town. Her only choice is to look for him on her own. Disregarding her own safety, Amy goes in search of Billy's alleged meth lab. Instead of finding a shed, she witnesses a vicious sacrifice. Too late to leave town, Amy is whisked away to a secret society, the Unseen,to help fight the Lost Society. This book is packed with demons, action, and small victories, and heavy losses. The book started slow for me, but once the plot started to u fold, I could not put my kindle down. I really liked this book and can't wait to read the next one!!! Can you imagine coming to back to your home town looking for your brother; to find demons have taken over! Well that is what happens in this fast moving story about a home town girl that returns to look for her brother and ends up fighting a battle for her life and the lives of her friends. I needed a change and when asked to give an honest review of this book I jumped at the chance. I am so glad that I did. Was given a copy for an honest review. I would give it a 4.5 stars as it took me a bit of time to get into the book but when I did it was hard to put down.Click has some crazy and twisted demons running through the book and mind of his.Give it a try as it was a nice quick read that will have you looking in the closet and under the bed before going to bed. i really really like this one!! Pretty strange but good book.This book is full of odd things, demons, witches, evil drug dealers trying to take over the world using helps minions. It's a pretty good story and definitely different then most.Amy returns to Blackwater to find her brother who has not answered her calls in a couple weeks. she finds his house empty except for some kind if creature. She ends up at her old best friends house for the night. She's not welcome from her man and us kicked out but left a note to meet Marci at their old secret spot. Mar I tells her to leave or they will kill her. She's been told this from various people since she's arrived. She does leave but only making it to the next town for the night then decides to go back. She's very stubborn. She ends up seeing something she shouldn't have and then us almost killed but saved by Shane , a ex school mate , only to find out he knows what's going on in town and has to keep her safe it they will kill her.they have her DNA from a brush they stole and this Sovik that runs the town will use it and his demo n s to track her.Shane takes her to a camp she first hates but then becomes kinda accustomed to learning to fight amount other thing. Their are demon incidents. People killed. Then they decide to take down solvik .they think they have it configure out when all goes wrong and they are ambushed. Amy is captures so neaomi and given a choice with their powers to let them use their eggs to bring demon children into the works with witch powers. This us all crazy stuff . Amy finds a chance to try to escape and does only to find her friends, Shane, bloody one and nynx are there to help. We get another surprise here as well.in the end all turns out better then hoped. I don't want to give away all the good stuff so um not. You can read it.I'd recommend this one. It's well written. Weird. And some of the names of the demons just made me laugh. A few of the times reading it I didn't like the way it kept say and.....said. it was too repetitious in some areas they way it was whiteout it didn't take away from the book. It's just a bit annoying to me. Other then that it's a cool story. a must read for stephen king fans and horror fans. full of demon slaying and corruption. a sister on a search for her missing brother stumbles onto a town overcome with drugs and satanism. grotesque sacrifice to demons by a corrupt mayor. amy witnesses one such sacrifice her dna collected now the satanist mayor n his gruesome demons are in search for her. a childhood friend comes to her aid n sends her to the unseen group where they are in constant training to rid this delemma . upon the big fight things go awry the leader n amy are captured by the enemy . she finds her brother captured by these same people to find he has been lobotomized . can she escape the horrors in this compound when the leader can read her every thought? can she save the leader of her group and her brother and rid the world of these horrendous demons? whatever you think will happen while reading this page turning action packed horror thriller will surprise you in the end . i look forward to more from this author five star read. I thought this book was pretty good. The beginning was amazing, but I struggled through the middle. I think it was necessary though to fully grasp the story and characters. The end sped up again and kept my attention and had me looking forward to see what happens next! This isn't my usual kind of book, to be fair, but I enjoyed changing it up a bit ! Harvey Click - Harvey Click earned an M.A. in English from Ohio State University, using his first novel as a master's thesis. He has written five novels, four of them in the horror genre, and numerous short stories. He has taught both English and creative writing for Ohio University, Ohio State University, the James Thurber House, and OSU's Creative Arts Program.